It is really easy for indoor cats to become overweight. They don’t have as much opportunity for exercise as their outdoor counterparts, so it is important that you make that opportunity for them. Cats are active in nature; if given the chance, they will play and move around. It only takes a few minutes a few times a day for your cat to get a healthy amount of activity. Cats are nocturnal in nature, so if you are an early riser or a night owl, you may have more luck with engaging them in activity before the sun comes up and after the sun goes down. Before bed is an especially good time to squeeze in some activity, especially if you have a kitty who likes to run around and make noise in the middle of the night. When you think about the kinds of activities you can do with your cat, remember they are also natural hunters. Any game or activity that includes them stalking their “prey” is likely to entice their interest. We’ve put together a list of our favorite ways to get your cat more exercise, check it out below! Cats love to climb. If you’d prefer that they avoid climbing on counters or refrigerators or cabinets, then a cat tower is a great toy to have. Most cat towers are made of durable material that your cat can also use as a scratching post. You can get involved in the fun by placing toys on different levels for your cat to climb up and get. We’ve all seen the videos by now of cats (along with other animals) chasing around the dot from a laser pointer. This is very amusing for humans to watch, but can also be a great way to engage your cat in some exercise. Be extremely careful to never shine the light into your cat’s (or anyone’s) eyes, as laser pointers can be very damaging to eyesight. Your cat will love chasing around and trying to catch the elusive dot, and you’ll get a good laugh as well! Okay, we get it, cats on a leashes sounds silly, but hear us out! Indoor cats might be a little nervous about this at first, but it might end up being a very enjoyable activity with your cat and a great way for you both to get exercise! Always using a harness is important, and starting slow will help too. Break out the leash for walks around the house at first, and then go further and further. 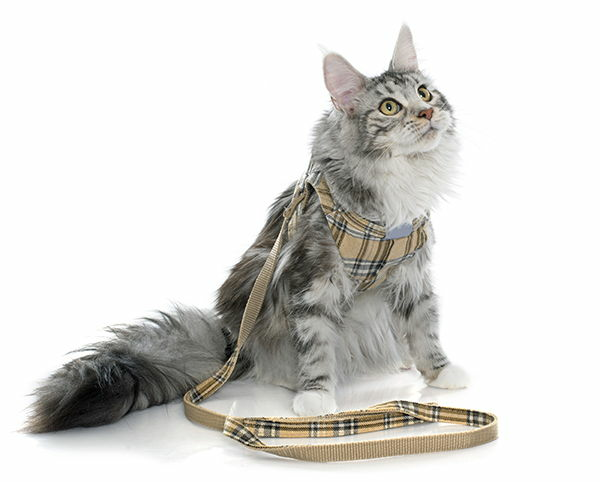 Look here for more tips on how to leash train your cat. Having things delivered to your home from online shopping is becoming more and more common. Not sure what to do with those boxes, other than recycle them? Why not let your cat play with them for a bit before you put them in the bin? Placing a toy inside a box (or a few boxes) is a great way for your pet to get some activity. Cats love going inside of things. You could even put the boxes on different levels so that some jumping is mixed in as well. Have an old toilet paper roll? Use it as a toy with your cat by rolling it across the floor. There are plenty of things you can do with items you naturally have around the house to play with your kitty. You don’t have to spend a lot of money on toys to help your cat be more active. As we said before, cats are natural hunters. In the wild they would hunt for their prey, and that is an instinct even indoor cats have retained. Consider splitting their food up into three or four bowls. You can then put those bowls around the house, even on counter tops, or ledges in your home. The first few times you do this, walk your cat around with you and show them the places you’ve put their food. Then after a while, hunting for their food bowls will become a part of their routine. They get exercise and their meal! If you have more questions about the ways you can get your indoor cat more exercise, call the experts at Academy Animal Hospital today. They can help you in any way you need with the health and wellbeing of your feline friend.